Saturday marked one year since a devastating fire damaged a landmark church in Chicago's Woodlawn neighborhood. CHICAGO (WLS) -- Saturday marked one year since a devastating fire damaged a landmark church in Chicago's Woodlawn neighborhood. The congregation at Shrine of Christ the King Church held an outdoor "rally for resurrection" on Saturday. The high mass was held in a nearby vacant lot, where parishioners got an update on construction to rebuild their church. Leaders thanked the Chicago firefighters who battled the flames one year ago. "They courageously saved our home from destruction," said Rev. Cannon Matthew Talarico. "They have made possible our future." 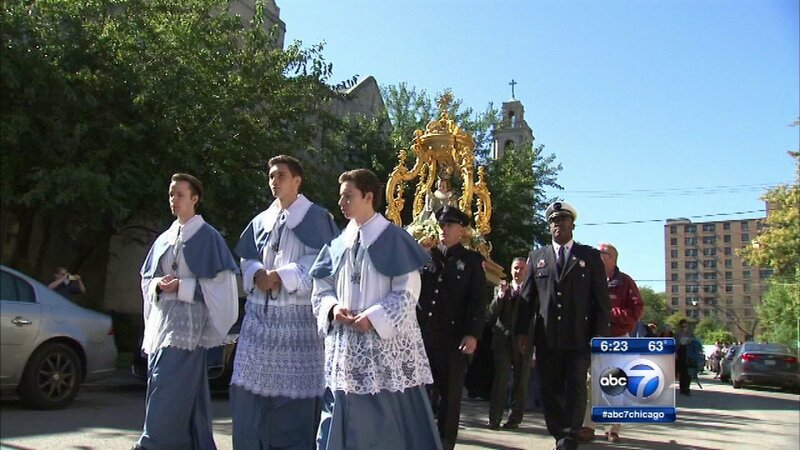 Firefighters carried the shrine's newly restored 17th century statue of Christ the Infant King in a special procession.